It is widely believed that cell-size checkpoints help to coordinate cell growth and cell-cycle progression, so that proliferating eukaryotic cells maintain their size. There is strong evidence for such size checkpoints in yeasts, which maintain a constant cell-size distribution as they proliferate, even though large yeast cells grow faster than small yeast cells. Moreover, when yeast cells are shifted to better or worse nutrient conditions, they alter their size threshold within one cell cycle. Populations of mammalian cells can also maintain a constant size distribution as they proliferate, but it is not known whether this depends on cell-size checkpoints. We show that proliferating rat Schwann cells do not require a cell-size checkpoint to maintain a constant cell-size distribution, as, unlike yeasts, large and small Schwann cells grow at the same rate, which depends on the concentration of extracellular growth factors. In addition, when shifted from serum-free to serum-containing medium, Schwann cells take many divisions to increase their size to that appropriate to the new condition, suggesting that they do not have cell-size checkpoints similar to those in yeasts. Proliferating Schwann cells and yeast cells seem to use different mechanisms to coordinate their growth with cell-cycle progression. Whereas yeast cells use cell-size checkpoints, Schwann cells apparently do not. It seems likely that many mammalian cells resemble Schwann cells in this respect. Cell growth is as fundamental for organismal growth as cell division. Without cell growth, no organism can grow. Yet, compared to cell division, cell growth has been inexplicably neglected by cell biologists. Proliferating cells in culture tend to double their mass before each division , but it is not known how cell growth is coordinated with cell-cycle progression to ensure that the cells maintain their size. We have been studying how this coordination is achieved in mammalian cells, using primary rat Schwann cells as a model system . Cell growth occurs in all phases of the cell cycle except M phase [1, 3]. Yeast cells are thought to coordinate cell-cycle progression with cell growth through the action of cell-size checkpoints in G1 and/or G2, where the cell cycle can pause until the cell reaches an adequate size before proceeding into S or M phase, respectively [4, 5]. It is still uncertain how such checkpoints work, although there is evidence that the coupling of the threshold levels of certain cell-cycle activators to the general rate of translation plays a part [6, 7]. It is also unknown whether mammalian cells have cell-size checkpoints, although it is widely believed that they do [3, 7–9]. For most populations of proliferating eukaryotic cells in culture, including yeast cells and mammalian cells, the mean cell size remains constant over time, even though individual cells vary in size at division . Thus, cells that are initially bigger or smaller than the mean after mitosis tend to return to the mean size over time. How is this achieved, and is the mechanism the same for all eukaryotic cells? For yeast cells, it has been shown, by blocking cell-cycle progression and measuring cell growth rate, that big cells grow faster than small cells . Thus, for a population of yeast cells to maintain a constant average cell size and cell-size distribution, it would seem that cell-size checkpoints must be operating. Without such checkpoints, yeast cells that are born larger than the mean birth size will grow faster than those that are born smaller, and these larger cells will produce still larger daughters, which will then grow even faster . Thus, the spread of sizes in the population would increase over time, which does not happen, presumably because cell-size checkpoints ensure that cells that are larger or smaller than the mean at cell division tend to return toward the mean before dividing again. The yeast cell-size checkpoints are regulated by nutrients . Cells proliferating in nutrient-rich media generally grow at a faster rate and divide at a larger size than cells proliferating in nutrient-poor media . When switched from a nutrient-poor medium to a nutrient-rich medium, the cell cycle arrests and resumes only when the cells have reached the appropriate size for the new condition, which occurs within one cell cycle . Thus, the cells can adjust their size threshold rapidly in response to changing external conditions. It is often assumed that animal cells also coordinate cell growth with cell-cycle progression by means of cell-size checkpoints [3, 7, 13, 14], although the evidence for this is weak. Proliferating mammalian cells, like proliferating yeast cells, maintain a constant average cell size and size distribution over time despite differences in the size of cells at division, but this does not necessarily mean that cell-size checkpoints are operating . If large cells do not grow faster than small cells, a cell-size checkpoint is not required to account for this behavior . This is illustrated in Figure 1, where the sizes of two, unequally sized, hypothetical daughter cells are followed through several cell cycles. If the cells and their progeny grow and progress through the cell cycle at the same rates, they will eventually converge to a common mean size (Figure 1). The sizes converge, even in the absence of a cell-size checkpoint, because the larger cells do not double their cell mass each cycle, and the smaller cells more than double their cell mass each cycle . Thus, proliferating cells can maintain a constant average size and size distribution without cell-size checkpoints, as long as individual cells grow at the same rate irrespective of their size. Without cell-size checkpoints, however, cells that are born larger or smaller than the mean birth size will take longer to attain the mean birth size than if they had cell-size checkpoints. A hypothetical model showing why the progeny of large and small daughter cells eventually return to the mean population size over time if large and small cells grow and progress through the cell cycle at the same rates (after Brooks ). The initial division is unequal and produces one cell of 10 mass units and one cell of 1 mass unit; the subsequent eight divisions of the progeny cells are equal. Following the first division, each cell grows 5.5 mass units in each cycle. Thus, the initial small daughter cell grows to 6.5 units before it divides to produce two daughters of about 3.2 units each, while the initial large daughter cell grows to 15.5 units before it divides to produce two daughters of about 7.8 units. We showed previously that, unlike in yeasts, cell growth is not necessarily rate limiting for cell-cycle progression in primary rat Schwann cells . Extracellular mitogens that promote cell-cycle progression but not cell growth can shorten the cell cycle in Schwann cells . This finding suggested that yeasts and Schwann cells might use different strategies to coordinate cell growth and cell-cycle progression. It did not, however, indicate whether Schwann cells use cell-size checkpoints for this coordination. Here, we show that, unlike yeasts, primary rat Schwann cells grow at a rate that is independent of their size, over a large range of sizes. In addition, we demonstrate that, unlike yeast cells, Schwann cells do not adjust their size quickly when shifted from a relatively poor to a relatively rich environment; instead, their mean cell size increases gradually over many divisions. These results suggest that Schwann cells, and probably many types of mammalian cells, do not need and do not have cell-size checkpoints. Instead, they apparently use extracellular signals to coordinate their growth with cell-cycle progression. We purified Schwann cells from postnatal day 7 rat sciatic nerve by sequential immunopanning. We maintained the cells in a proliferative state in 'complete' medium: Dulbecco's modified Eagles' medium (DMEM), supplemented with 3% fetal calf serum (FCS), the neuregulin glial growth factor 2 (GGF 2), and the adenylyl cyclase stimulator forskolin. We passaged the cells before they reached confluence and measured their size (volume) in a Coulter Counter after removing the cells from the culture dish with trypsin at the time of passage. 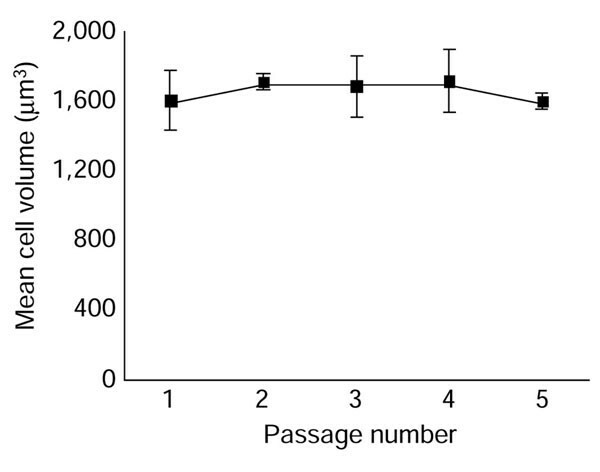 As expected, the average size of the cells remained unchanged with repeated passaging (Figure 2). Mean cell volume remains constant as purified Schwann cells proliferate in complete medium and are passaged every three days. Their volume at passage was measured in a Coulter Counter. Each point represents the mean ± standard deviation of three cultures. To determine if Schwann cell growth depends on cell size, we used the DNA polymerase α inhibitor aphidicolin to arrest the cells in S phase [2, 15]. We first made Schwann cells quiescent by growing them to confluence. We then replated them and treated them with aphidicolin and simultaneously stimulated them with complete medium to re-enter the cell cycle and begin to grow. In these conditions, the cells remained arrested in S phase and continued to increase in size for many days. If Schwann cell growth were like yeast cell growth, the rate of cell growth would increase over time as the cells enlarged, and the growth curve would be exponential-like . To determine cell-growth rate, we measured the volume of cells in parallel cultures every 24 hours after removing the cells from the culture dish with trypsin. As can be seen in Figure 3a, cell growth was linear over a period of 5 days, indicating that the cells added a constant amount of volume each day, independent of their size. To confirm that the increase in cell volume reflected an increase in protein, we measured the amount of protein per cell, with similar results (Figure 3b). The growth of aphidicolin-arrested Schwann cells is linear over time, indicating that it is independent of cell size. (a) Quiescent cells were cultured in complete medium with aphidicolin to arrest the cells in S phase. Cell volume was measured in a Coulter Counter at the time points indicated. Each point represents the mean ± standard deviation of the results derived from three independent experiments, where, for each experiment, the mode cell volumes of three plates were measured and averaged. (b) Cells were cultured as in (a), but protein per cell, rather than cell volume, was measured at the time points shown. The results are shown as the mean ± standard deviation of three cultures in one experiment, in which about 106 cells were assayed for each point. The experiments in (a) and (b) were performed three times with similar results. These findings indicate that large Schwann cells do not grow faster than small Schwann cells, at least in these conditions. 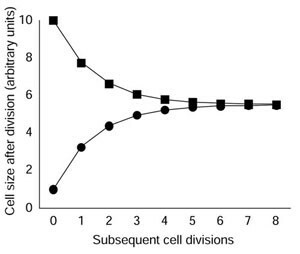 As explained in the Background, this means that cell-size checkpoints need not be invoked to explain why these cells maintain a constant average size (Figure 2) and cell-size distribution (not shown) when proliferating in complete medium. Although the experiments were not done with this question in mind, there have been previous reports indicating that other types of mammalian cells grow linearly, independent of their size. Hutson and Mortimore , for example, starved mice, which causes the liver to shrink rapidly, solely as a result of hepatocyte shrinkage, rather than an increase in cell death or a decrease in cell proliferation. When they re-fed the mice, the liver re-grew rapidly, entirely as a result of hepatocyte growth, which was clearly linear . Similarly, when Deleu et al. stimulated dog thyrocytes with insulin, the thyrocytes grew but did not proliferate, and the growth was linear. In an experiment to test whether cell-size checkpoints were necessary, Brooks and Shields  separated quiescent 3T3 cells by size and stimulated them to re-enter the cell cycle; they found that large cells did not grow faster than small cells at the same point in the cycle, consistent with linear growth. We have not found any reports in which big mammalian cells have been observed to grow faster than small cells of the same type and at the same point of the cell cycle. It thus seems likely that most mammalian cells grow linearly, independent of their size, and that they therefore do not require cell-size checkpoints to maintain a constant size distribution as they proliferate. Do large and small Schwann cells synthesize proteins at the same rate? Our finding that serum-stimulated, aphidicolin-arrested Schwann cells add the same net amount of protein per cell per day, independent of their size, raised the possibility that big Schwann cells synthesize protein at the same rate as small Schwann cells. To test this possibility we cultured Schwann cells in complete medium and aphidicolin and, after 24, 48, or 72 hours, added [35S]-methionine and [35S]-cysteine for two hours. We then measured the amount of radiolabeled protein per cell. As can be seen in Figure 4a, the rate of protein synthesis increased as the cells increased in size over time. Large Schwann cells synthesize and degrade protein faster than smaller cells. (a) Quiescent cells were cultured in 3% FCS, forskolin, and aphidicolin for various times. The rate of protein synthesis was then determined by measuring the amount of incorporation of [35S]-methionine and [35S]-cysteine into cellular protein over 2 hours. The rate of protein synthesis in proliferating cells is shown for comparison. The results are shown as the mean ± standard deviation of nine independent plates of cells. (b) Quiescent cells were treated as in (a) and then either harvested immediately (0 hours after pulse) to assess the rate of total protein synthesis or washed and 'chased' with medium containing non-radioactive methionine and cysteine for 2 or 6 hours before harvesting to assess the rate of protein degradation. Each point represents the mean and range of three independent cultures. The rate of protein degradation is indicated by the slope of the line. The shallowness of the curve for the 24-hour-arrested cells is likely to be the result of the lower than expected value at 0 hours. The 0 hour result in (a) is likely to be more accurate, as it represents the mean of nine independent cultures, instead of three. If one uses the value of 80, the curve in (b) for the 24-hour-arrested cells would be steeper. The experiments in (a) and (b) were performed three times with similar results. As the net amount of protein added per day does not increase as the Schwann cells get bigger (Figure 3), the rate of protein degradation (and/or secretion) must also increase as the cells get bigger. To determine the rate of protein degradation, we cultured the cells in complete medium and aphidicolin and, after various times, added [35S]-methionine and [35S]-cysteine for 2 hours, as before. We then washed the cells and incubated them in non-radioactive medium for a 2 or 6 hour 'chase'. As can be seen in Figure 4b, the rate of decrease in radiolabeled protein increased as the cells increased in size. Thus, the rates of both synthesis and degradation of short-lived proteins increase with Schwann cell size, and the net accumulation of protein is independent of size. It remains a mystery how mammalian cells maintain a constant difference between protein synthesis and degradation independent of their size, although there is evidence that this tight coupling between protein synthesis and degradation can depend on extracellular signals . We showed previously that Schwann cell growth depends on extracellular signals, such as those present in FCS. 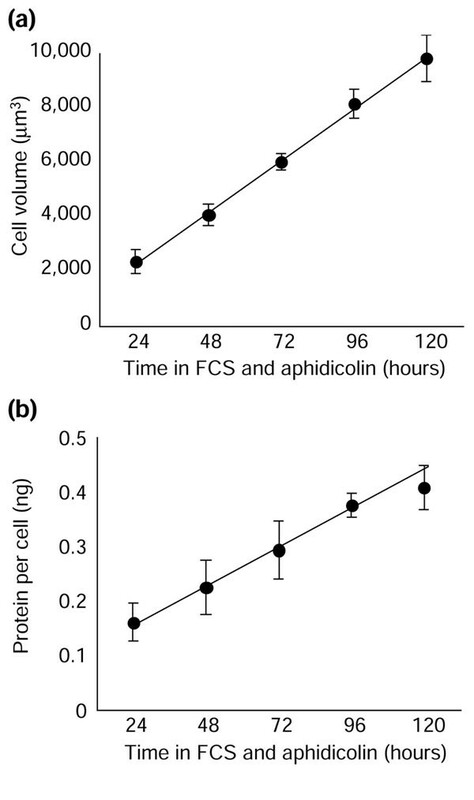 To determine if cell growth remains linear in different concentrations of such extracellular factors, we cultured quiescent Schwann cells in aphidicolin and various concentrations of FCS, and measured cell volume over time. As can be seen in Figure 5, the rate of growth remained linear for up to 9 days (Figure 5a) but increased with increasing amounts of FCS (Figure 5b). Even in 50% serum, cell growth remained linear and was faster than in 10% serum (not shown). Thus, even at high concentrations of FCS, it seems that the levels of extracellular growth factors, rather than anything inside the cells, limit Schwann cell growth. Schwann cell growth remains linear for 9 days but increases with increasing concentrations of serum. In (a) the cells were cultured in 1% FCS, forskolin, and aphidicolin, while in (b) they were cultured in forskolin and aphidicolin and various concentrations of FCS. Cell volume was measured in a Coulter Counter at the time points indicated. Each point represents the mean ± standard deviation of at least three cultures. The experiments were performed at least three times with similar results. (c) The cells were cultured as in (a), but each point represents the mean ± standard deviation of cell volumes from one plate of cells. 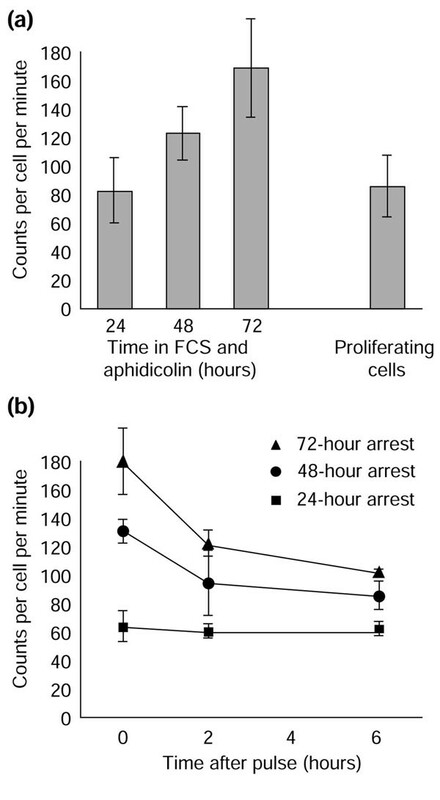 In Figure 5c, we show how the spread of cell sizes changed as aphidicolin-arrested Schwann cells grew over time. Like cell size itself, the spread of sizes increased linearly with time, as expected in a situation where some cells are growing faster and some slower than the mean rate, but all are growing linearly, independent of their size. We have shown that the growth rate of Schwann cells is linear, unlike in yeasts, which means that cell-size checkpoints are unnecessary to explain how proliferating Schwann cells maintain their size in a particular environment. As discussed in the Background, a crucial line of evidence for the existence of cell-size checkpoints in yeasts is that they can rapidly change the size at which they divide, by adjusting their size threshold, when switched to different nutrient conditions . We therefore tested whether proliferating Schwann cells behave similarly when shifted from serum-free to serum-containing culture medium. If Schwann cells had cell-size checkpoints, one might expect them to adjust their size rapidly to the new condition. If they do not have such checkpoints, one would expect the cells to adjust their size only gradually to the new conditions over a number of cell cycles, much as illustrated for the small cells in Figure 1. We maintained purified Schwann cells in a proliferative state on laminin, in DMEM supplemented with GGF 2, forskolin, insulin, and serum-free Schwann-cell-conditioned medium, with or without 3% FCS, passaging the cells when they reached near-confluence. In both conditions, the Schwann cells maintained their average size over time, when assessed at the time of passage (Figure 6a), although the cells in serum were, on average, more than twice the size of cells without serum (Figure 6b). In this respect, the cells behave similarly to yeast cells, which grow at a faster rate and divide at a larger size when proliferating in a nutrient-rich medium than in a nutrient-poor medium . Schwann cells adjust their size slowly when shifted from serum-free (SF) medium to serum-containing (SC) medium. The cells were plated at 100,000 cells per well and were passaged when they reached a density of about 300,000 cells per well. (a,b) The mean volume of cells proliferating in either SC or SF medium was measured in a Coulter Counter at the time of passage. The raw data for each condition are shown in (a), and the mean ± standard deviation of the mode cell volume at passage is shown in (b). (c,d) The cell-cycle time of Schwann cells proliferating either in SC medium or in SC medium after a shift from SF medium was measured by determining the rate at which cell number increased. The raw data for each condition are shown in (c), and the mean ± standard deviation of four population-doubling times is shown in (d). (e) The size of cells proliferating in SC medium, in SF medium, or in SC medium after a shift from SF medium ('switched' cells) was measured every day in a Coulter Counter. Because the cells in SC medium and the switched cells had similar cycle times see (d) they were passaged about every 3 days in both cases, when they reached around 300,000 cells per well; the cells in SF medium cycled more slowly and were thus passaged less often. These experiments were performed three times with similar results. We then switched the Schwann cells that had been proliferating in serum-free medium to serum-containing medium. We plated these 'switched' cells and the cells maintained throughout the experiment in serum-containing medium at the same plating density – both now in serum-containing medium. We passaged them when they reached about 300,000 cells per well, which was usually every 3 days. We counted cell numbers and measured mean cell volume of the population every day using a Coulter Counter. The average cell-cycle times of the two populations were approximately the same (Figures 6c,d). Unlike yeasts, the switched cells took around six divisions and about 10 days before they divided at the characteristic size of Schwann cells maintained in serum-containing medium all along (Figure 6e). The finding that big Schwann cells grow at the same rate as small Schwann cells means that they do not require cell-size checkpoints to maintain a constant size distribution as they proliferate. The finding that they take many divisions to adjust to new culture conditions strongly suggests that they do not have such checkpoints, or at least not ones that resemble those operating in yeast cells. In addition, their slow adjustment to a change in culture conditions is the behavior predicted by the hypothetical model illustrated in Figure 1 for proliferating cells that grow linearly and do not have cell-size checkpoints. Whereas proliferating populations of yeast cells and Schwann cells can both maintain a constant size over time, they seem to do so in very different ways. For yeasts, cell-size checkpoints apparently operate to coordinate cell growth and cell-cycle progression. For Schwann cells, by contrast, extracellular signals that stimulate cell growth, cell-cycle progression, or both, appear to control the size at which the cells divide . 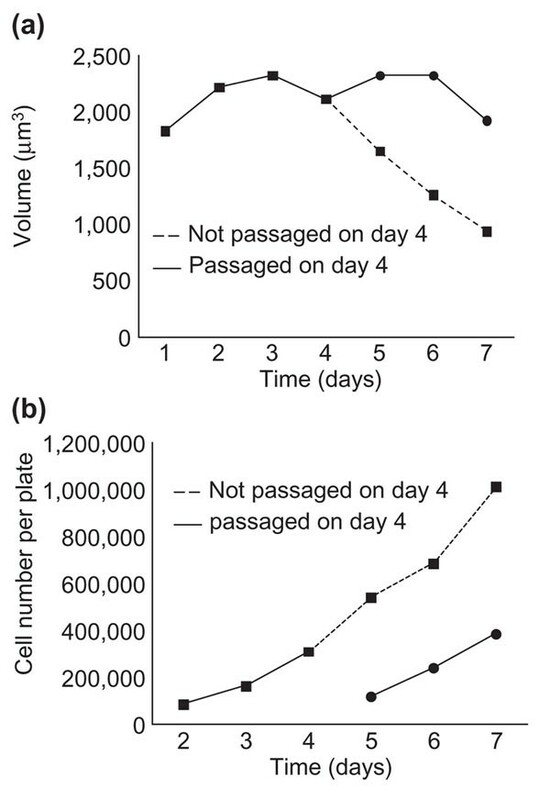 Although a population of Schwann cells maintained a constant average cell size if passaged frequently (Figure 2), the cells decrease in size if not passaged, even if the medium was replaced every day (Figure 7a), although they continue to proliferate (Figure 7b). This is presumably because there was increased competition for extracellular growth factors as the cultures got denser. A similar competition for extracellular signals has been shown to regulate the size of lymphocytes in vivo [20, 21]. Apparently, signaling for Schwann cell growth is more affected by the competition than signaling for cell-cycle progression. We found previously that Schwann cells do not maintain a constant size over time when proliferating in insulin-like growth factor I (IGF-I) and GGF 2 in the absence of FCS or Schwann-cell-conditioned medium , presumably because growth stimulation was insufficient to keep up with mitogenic stimulation. Schwann cells need to be passaged to maintain their size. Cells were cultured in serum-containing medium, with or without passaging on day 4. In both cases, 100,000 cells were plated per well, and the medium was changed every day. Mode cell volume (a) and cell number (b) were measured every day in a Coulter Counter. The experiment was performed twice with similar results. We suspect that the size of most proliferating animal cells in vivo is controlled by the levels of extracellular signals in a way that is similar to how Schwann cell size is controlled in culture. In the few studies that have analyzed the size of proliferating animal cells during normal development, for example, it seems that cell size can vary significantly for the same cell type. During development of the wing imaginal disc in Drosophila, for instance, the size of the disc cells varies throughout development: the cells initially grow without dividing and then proliferate and get progressively smaller . Why do yeasts and Schwann cells coordinate cell growth and cell-cycle progression so differently? The lifestyles of yeasts and animal cells are crucially different. As a unicellular organism, each yeast cell grows and divides as fast as the nutrient supply allows, and it must quickly adapt to changing extracellular conditions. The growth and division of animal cells, by contrast, must be carefully controlled and coordinated for the good of the animal as a whole, and this control relies mainly on intercellular signaling. Thus, whereas yeast cell proliferation is controlled mainly by nutrients, animal cell proliferation is controlled mainly by signals from other cells. As such signals seem usually to be present at limiting, rather than saturating, concentrations , small changes in their levels can powerfully influence cell growth and proliferation. Given its importance, it is surprising how little is known about how the levels of such signals are controlled in animals. Animal cell proliferation also depends on nutrients, however, and our results do not exclude the possibility that cell-size checkpoints might be revealed by nutrient deprivation experiments. Our findings also do not exclude the possibility that animal cells such as lymphocytes, which can proliferate in suspension like yeast cells, might use cell-size checkpoints to coordinate their growth with cell-cycle progression. These will be important avenues to explore in the future, but we shall leave this to others. All reagents were from Sigma-Aldrich (Gillingham, UK), unless indicated otherwise. For experiments on growth rate, Schwann cells were purified from postnatal day 7 rat sciatic nerve by sequential immunopanning as described previously . The cells were expanded on poly-D-lysine- and fibronectin-coated culture dishes (Falcon; BD Biosciences, Oxford, UK) in 'complete medium': DMEM (Gibco; Invitrogen Ltd, Paisley, UK) supplemented with 3% FCS, 1 μM forskolin (Calbiochem; Merck Biosciences, Nottingham, UK) and 20 ng/ml recombinant GGF 2 (a gift from M. Marchionni, Cambridge NeuroScience Inc., Cambridge, USA). Cells were passaged every 3 days and were > 99.9% pure as judged by antigenic markers . For the switch experiments, purified Schwann cells were maintained in a proliferative state on poly-D-lysine- and laminin-coated culture dishes, in DMEM supplemented with 20 ng/ml GGF 2, 1 μM forskolin, 10 μg/ml insulin, serum-free Schwann-cell-conditioned medium (to a final concentration of 20%), 100 μg/ml transferrrin, 100 μg/ml bovine serum albumin, 16 mg/ml putrescine, and 40 ng/ml selenium, either with (serum-containing SC medium) or without (serum-free SF medium) 3% FCS. Cells were plated at a concentration of 100,000 cells per well of a six-well culture plate (Falcon) and passaged when they reached a concentration of around 300,000 cells per well. For cell-growth experiments, quiescent Schwann cells were obtained by culturing them to confluence in complete medium. About 4 × 104 quiescent cells were then plated in each well of a six-well poly-D-lysine- and fibronectin-coated culture dish in DMEM containing 1%, 3%, 10%, or 50% FCS and 2 μg/ml aphidicolin to arrest the cells in S phase. Cell volume and cell number (to assess cell-cycle time) were assessed every 24 hours in a Coulter Counter (Multisizer II, Beckman-Coulter, High Wycombe, UK), using a volumetric analysis, after removing the cells from the culture dish with trypsin-EDTA (Gibco) and resuspending them in Isoton II (Beckman-Coulter). Between 1,000 and 5,000 cells were counted per well, and the data were analyzed using Coulter Multisizer Accucomp software (Beckman-Coulter). About 106 quiescent cells were plated in a poly-D-lysine-and fibronectin-coated 15 cm culture dish (Falcon) in DMEM containing 1%, 3%, or 10% FCS and 2 μg/ml aphidicolin. Protein content was assessed every 24 hours. The cells were rinsed twice with phosphate-buffered saline (PBS), scraped off the dish, and centrifuged at 3,000 × g for 3 minutes. The cells were then resuspended and two aliquots were removed – one for cell number analysis and one for protein analysis. Cell number was determined by measuring the concentration of DNA in the aliquot and assuming the haploid amount of DNA per cell is 6 pg. Protein concentration was determined by lysing the cells on ice for 15 minutes in 0.4% Triton and 0.2% sodium dodecyl sulfate (SDS), in the presence of protease inhibitors (Boehringer Mannheim) and using a micro-BCA (bicinchoninic acid) assay with a bovine serum albumin (BSA) standard. About 105 quiescent cells were plated in a poly-D-lysine- and fibronectin-coated 6 cm culture dish in medium containing 3% FCS and 2 μg/ml aphidicolin. In one experiment, the protein synthesis rate of proliferating cells in complete medium was determined. At the time point to be investigated, cells were washed twice with cysteine- and methionine-free DMEM (Gibco). Then, 2.5 ml of this DMEM was added, together with glutamate, forskolin, 3% FCS, and 100 μCi of [35S]-methionine and [35S]-cysteine (Amersham, Little Chalfont, UK) for 2 hours at 37°C. The amount of radiolabel was saturating, as the amount in the medium did not decrease significantly during the 2-hour incubation. To determine the protein synthesis rate, the cells were then washed, trypsinized, centrifuged at 3,000 × g, and resuspended in serum-free medium. Aliquots were taken for cell-number analysis in a Coulter Counter and for protein analysis. Radiolabel incorporation into protein was assessed by lysing the cells in 0.2% Triton and then removing three aliquots and counting each in a scintillation counter. Then, 100% ice-cold trichloroacetic acid (TCA) was added to each aliquot to a final concentration of 10%, to precipitate the protein. After 10 minutes on ice, the solutions were centrifuged at 12,000 × g to pellet the precipitated protein, and the amount of free radiolabel was assessed by removing three aliquots and counting them in a scintillation counter. The amount of radiolabel incorporated into protein was calculated by subtracting the value of the non-incorporated label from the value of the label in the total cell lysate. To determine the rate of protein degradation, cells were radiolabeled as above, washed three times with complete medium, and then left for either 2 or 6 hours at 37°C. The amount of radiolabeled protein still remaining in the cells after the chase was determined as described above. This work and the authors were supported by the Medical Research Council of the UK. We are grateful to Robert Brooks, Murdoch Mitchison, and Paul Nurse for helpful discussions. The authors of the second research article in this print issue(http://jbiol.com/content/2/1/7) have both had close associations with Journal of Biology, and Martin Raff continues to do so. Neither author was involved in the refereeing of this article, in the decision to publish it, or in the choice of accompanying commentary.